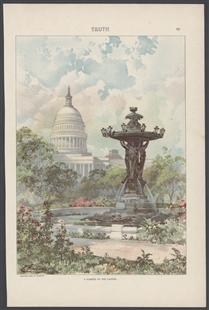 The Bartholdi Fountain first came to Washington, D.C., in 1877, after a stint at the 1876 International Exposition in Philadelphia. 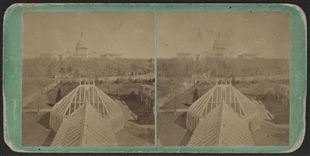 The public complained that the fountain was hidden amid the trees of the garden. 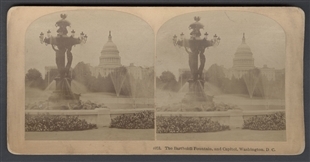 “Why will not some one induce the proper authorities to remove the fine Bartholdi fountain from its burial place in the Botanical gardens?” a reader angrily asked the Washington Post. 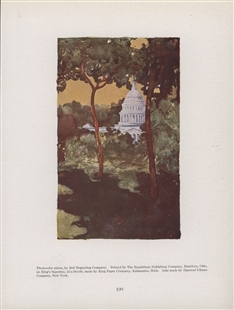 In contrast to the public outcry, this lithograph depicts the fountain’s environs as a lush and colorful spot with a view of the Capitol.